“It’s not just students and households with credit cards who are being ripped off. The scandal of the Private Finance Initiative, launched by John Major, has resulted in huge, long-term costs for tax payers, whilst handing out enormous profits for some companies. Profits which are coming out of the budgets of our public services. Over the next few decades, nearly two hundred billion is scheduled to be paid out of public sector budgets in PFI deals. In the NHS alone, £831m in pre-tax profits have been made over the past six years. As early as 2002 this conference regretted the use of PFI. Jeremy Corbyn has made it clear that, under his leadership, never again will this waste of taxpayer money be used to subsidise the profits of shareholders, often based in offshore tax havens. 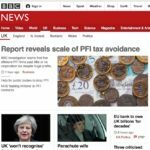 The government could intervene immediately to ensure that companies in tax havens can’t own shares in PFI companies, and their profits aren’t hidden from HMRC. We’ll put an end to this scandal and reduce the cost to the taxpayers. How? We have already pledged that there will be no new PFI deals signed by us. But we will go further. I can tell you today, it’s what you’ve been calling for. Labour today commits to signing no new PFI deals, to look to bring existing contracts back in-house and to develop alternative public sector models for funding infrastructure, saving the public money and improving services and working conditions. Labour will review all PFI contracts and, if necessary, take over outstanding contracts and bring them back in-house, while ensuring NHS trusts, local councils and others do not lose out, and there is no detriment to services or staff. On top of the billions of pounds paid out to shareholders, an estimated £28bn is being lost through costs incurred by problems associated with PFI, including higher interest rates, bail outs and management fees. – quality of delivery on service and construction contracts. 2. Consult on amending or repealing legislation which provides government underwriting of unitary payments to PFI companies whilst ensuring the sustainability of public sector budgets reliant upon previous forms of PFI credits and payments. Existing PFI schemes were supposed to remove risk from the public sector but have failed to do so. 3. Consult on appropriate methods for returning the ownership and responsibilities of SPVs [special purpose vehicles] to the public sector, with shares-for-bonds nationalisation (via an Act of Parliament) the presumed preferred approach. Shares held in countries deemed tax havens may be compensated at a different rate from others. Differential compensation rates for equity held by pension funds will also be considered. 4. Ownership of assets and responsibilities for services will be returned to the bodies who have been paying for them, and who no longer need to make unitary payments. 5. Develop a new public sector design/construction model based on public investment that enhances public sector capabilities to plan, design, manage and operate public infrastructure. Examples we will consider include the USA’s construction management at-risk. Our intention is not just to take over existing assets but to build the capacity to deliver projects better in future. 6. Enshrine the rights of staff to have rights kept or enhanced to comparable public sector standards on transfer to public sector bodies. 7. End the UK government’s financial and advisory support for similar projects overseas. Published on 25th September 2017. Last updated 6th April 2019. Published on 17th July 2017. The European Services Strategy Unit is pleased to launch a radical redesign of the website — www.european-services-strategy.org.uk. Many thanks to Chris Croome of Webarchitects Coop (who have hosted and supported the website since 1998) and Mina Nielsen for the redesign. Hopefully the website is easier to navigate and access the large volume of evidence. If you experience any problems, please inform dexter.whitfield@gmail.com. The the old site has been archived — european-services-strategy.org.uk.archived.website. Snapshots of the earlier Centre for Public Services website, going back to 1998, are available at the Internet Archive. Published on 15th June 2017. Last updated 11th January 2018. On 1 April 2017 the operation of the Tyne and Wear Metro finally returned to public provision. The North East Combined Authority decided not to extend the Deutsche Bahn 7-year operational contract for a further two years because of dissatisfaction with service performance. A new fleet of trains is planned in the next few years, however, the government is insisting on retendering the contract in 2019. RMT General Secretary Mike Cash said “The union is demanding that there is no repeat of the privatisation mistake and that the Metro service is now permanently returned to the public sector – run as a public service in the public interest.” 86% of a ChronicleLive public poll last year voted for the Metro to stay publicly run. An ESSU briefing ‘Not Fit to Run the Metro’ for the Northern TUC, UNISON and UNITE exposed Deutsche Bahn’s track record in Germany in 2009 prior to the contract. Published on 1st April 2017. Last updated 31st May 2017. The London Homelessness Social Impact Bond was designed to reduce rough sleeping, but led to two charities to work in partnership with Home Office agencies to ‘reconnect’ non-UK nationals by voluntary repatriation, administrative removal or deportation. This ESSU briefing raises critical issues for non-profits engaging in core state functions. Published on 12th March 2017. Last updated 7th June 2017. Somerset County Council plans to transfer the Council’s Learning Disabilities Provider Service to a new social enterprise established by Dimensions (UK) Ltd in April 2017. The service has an annual budget of nearly £30m and 1,160 staff. The social enterprise has announced plans to reduce all terms and conditions for the whole workforce, impose immediate redundancies, and to ‘redesign’ services with closures. This brief analysis highlights the risks and potential dire consequences of transferring services to social enterprises and arms length companies. Published on 6th February 2017. Last updated 7th June 2017.